This World Humanitarian Day, we want to make a statement that can't be ignored. We want the world to say 'I WAS HERE', and on August 19th commit to doing something good, somewhere, for someone else. From major international humanitarian operations to handing out food to the homeless, however big or small let's show the world that we believe in helping others. But for the world to take notice, we need to shout it loud, all at once. Join the UN, Beyoncé and global aid organisations in helping to reach 1 billion people, on 1 day, with 1 message by signing up to this Thunderclap. And on August 19th, we will flood the world with our message. At the top of the page support via Twitter, Facebook, or both, and get the word out to your friends and followers to do the same. On August 19th, make your mark by doing something good, somewhere, for someone else. 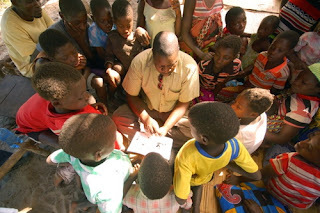 Visit whd-iwashere.org for suggestions of how you can make a difference. Watch as everyone's messages are simultaneously shared around the world, along with a special World Humanitarian Day performance by Beyoncé. In much of Africa, books are both expensive and hard to find - but almost every small town has a copy shop. Digital distribution start-up Paperight aims to bridge the gap, using copy shops to get affordable books to where they are needed, while protecting the rights of authors and publishers. Paperight partnered with Realmdigital, a leading developer of large-scale content distribution platforms, to develop the web-based system. The site now hosts hosts a growing library of text books, study material, fiction and other content that bypasses the production, distribution and retail cost associated with print publishing. Attwell says Paperight books could be 20% to 30% cheaper than their conventionally distributed counterparts. "Publishers can choose their own rights fees and Realmdigital has built a platform that makes it easy for printers to include this cost, and Paperight’s fee, into the final cost of printing a book for a customer." Murray Gough, Paperight’s account manager at Realmdigital, says the first version of the site, which went live in May, was developed in just two months. "We’ve tried to make it as easy to use as possible for everyone involved," he says. "Printers can buy prepaid Paperight credits, then search for and download books for their customers on request. The content is converted to PDF and printed right there, and the printer’s prepaid account is debited." To discourage illegal copying, each book is watermarked with the name of the buyer and the print shop, along with a unique URL for a website where readers can find additional content. Attwell says he’s often asked why he’s pushing paper when digital formats are the future: "I’ve worked in digital for five years and I truly believe it is the future. But I’ve concluded that we need a solution that works for everyone today. Paperight is that solution." For his part, Realmdigital CEO Wesley Lynch says he believes Paperight "promises to be one of the great developmental technologies coming out of Africa, with global potential. I hope the publishing industry gives it the support it deserves". If you have something, this looks like a great opportunity. As one of &Beyond’s ranger training guides, based in South Africa, I am passionate about wildlife and the people who care for it. When I heard about the Footprints of Hope campaign my mind started racing and the idea to walk through rural communities surrounding &Beyond’s lodges in the Kruger National Park, raising awareness for rhino conservation along the way was born. I was so excited I planned a route for a 10-day walk through small villages and &Beyond Ngala Private Game Reserve. The project came together quickly, and in December 2011, the team met at &Beyond Kirkman’s Kamp in the Sabi Sand Game Reserve to start walking. In remote regions like this, people struggle to support their families and sadly, rhino poaching can be an option for instant income. 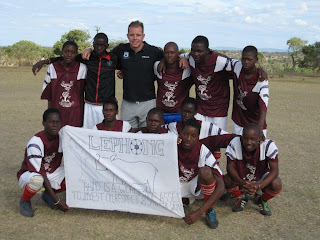 The aim of the walk was to chat to locals about the importance of rhino conservation, while teaching basic life skills and positive health - using soccer games to get the message across. We walked with Gordon Gilbert (a local soccer hero) and the Africa Foundation team (&Beyond’s community development partner) and it was life changing for me. I was touched by the people I met, who invited us into their homes, offering us cold drinks and water on a hot day, even when they have so little. They live simple lives making everyday worth living for. I was truly inspired by their positive attitudes. 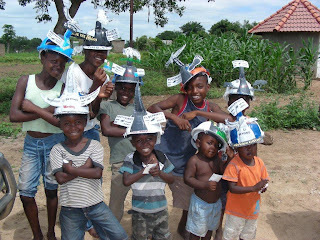 We wanted to teach children why we need to protect our rhinos for the future, and the value they hold for tourism as part of the Big Five. In June 2012, 262 rhino’s have already been killed in South Africa! We also told people about the anonymous hotline they could use to report poaching activity and that they can make a difference. After the walk, I received two leads, which I reported to the authorities. A priceless victory! This year, on Youth Day (16 June) we returned to the same communities with the Footprints of Hope team and we hosted a soccer tournament. It was a huge success with each soccer team carrying banners for rhino conservation and making pledges to conserve and protect the rhino. 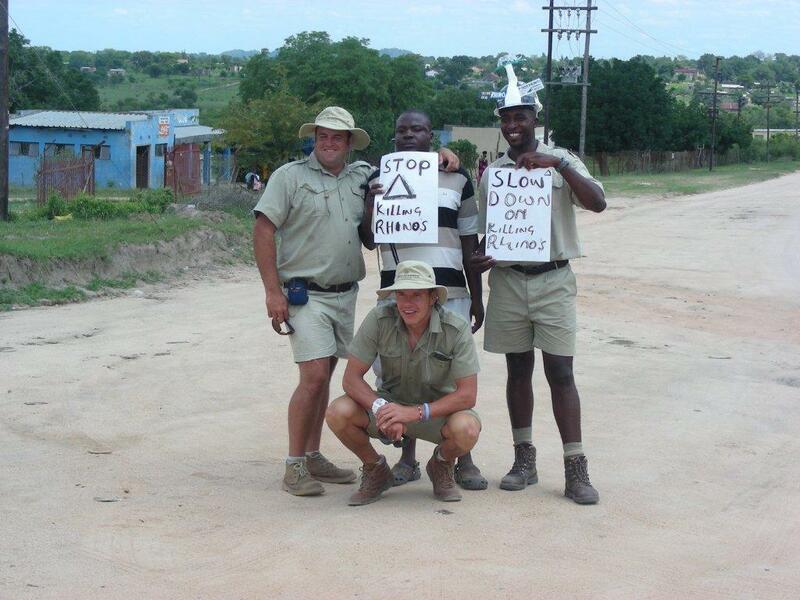 Even the Kruger Park anti-poaching team entered a team, and finally connected with the community. I reflect back on the days I spent as a ranger, tracking big game on foot and I remember how happy my guests were seeing rhino for the first time. I can only hope that we get a critical rhino message across - Rhino are only valuable to us while alive and South Africa needs our rhino. Education and awareness is vital in the fight against poaching, and it starts in the communities, when they understand the direct benefit of tourism and conservation. We need to protect our animals (and rhinos) because we want our children and grandchildren to enjoy our amazing wildlife forever. At &Beyond, we call this “Doing Well by Doing Good” and it’s one of the reasons I love what I do, knowing that I can make a small difference in the world. Although IREX began its work in the Soviet Union more than 40 years ago, today we implement a wide portfolio of programs in 41 countries in Africa. More than 20% of our program budget goes to African civil society actors, journalists, teachers, youth, and community leaders. Our programs draw on local expertise, NGOs and staff to deliver sustainable solutions well-suited for the African context. In honor of Africa Day, and the in spirit of unity and diversity it commemorates, we are pleased to share our new factsheet on IREX in Africa and some snapshots and thoughts from recent IREX visits to Africa. Susanna worked with teachers in Ghana - The TGC teachers (U.S.) and TEA/ILEP host teachers (Ghanaian) found solidarity and built lasting relationships through identifying ways in which teachers across the globe work in the midst of adversity to meet the ever increasing needs of students and communities. Robin and Aimee visited universities in Tanzania and Uganda: “This is exactly what we need!” was the one phrase that was repeated time and again in Uganda, Tanzania, and Ghana during outreach for the University Administration Support Program. It is incredibly rewarding to be working on a program that is such a perfect fit for the development of much-desired management reform in institutions of higher education in Africa. Kathy represented IREX’s senior management in Liberia: Enjoyed seeing the CSML program in action, visiting a community library in downtown Monrovia. There is a children’s corner where children can come and read books, books for adults and space for various trainings for adults. Onion farmers in central Kenya are receiving almost three times more money for their crops thanks to an initiative funded by FARM-Africa's Maendeleo Agricultural Technology Fund (MATF). Before the initiative farmers had no way to store their onions after they had harvested them. This meant that they had to sell them as soon as they were harvested when prices were at their lowest. Each farmer had no choice but to sell his produce to local traders as soon as possible whilst the onions were still in good condition. The local traders would play the farmers off against each other, forcing prices down even further. FARM-Africa has helped the onion farmers to form onion farming groups. The groups have been given the training they need to work as a marketing association (with around 20 farmer groups in each marketing association). The lead group in each association then helps all the members to decide together what a fair price would be for their onion harvest. If every group in the association then offers the traders the same price then they have no choice but to pay it if they wish to purchase onions from the village. The groups also received training in how best to store the onions to prevent them from rotting. MATF funds paid for a demonstration site where a storage facility was built so that all the other groups could replicate it using the knowledge and skills that they had learnt. Before the project farmers were receiving an average of around 10 pence per kilo of onions. The price is now around 28 pence per kilo. World Food Programme - Bringing Rays Of Hope In Niger. Nutrition programmes are bearing fruit in Niger where special food products are helping to protect young children from malnutrition as their families struggle to make it through a long and difficult drought. Fighting hunger worldwide - World Food Programme is a UN agency and the largest humanitarian organisation in the world. 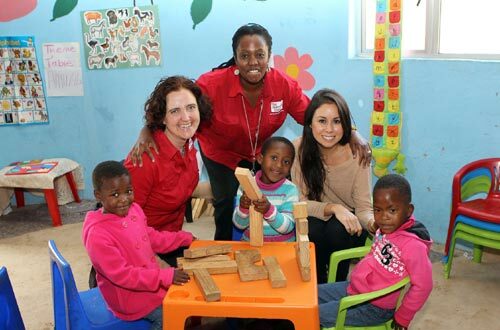 Stories of Hope... (Formally affectionately known as "Hope in Africa") is getting back in the saddle. Starting in Africa again we're planning to infect the world with Hope... join us! !